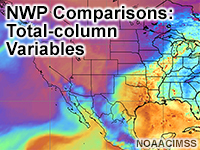 Another way to try to find mismatches between observed weather and NWP output is by using total-column variables. There are a few of them to choose from, and they make for a relatively simple comparison method for finding correctable mismatches. In this lesson, we'll address appropriate methods for making these comparisons and build to a point where we will focus on bigger picture atmospheric processes. This is the second in a series of video lessons that introduces three different methods for modifying NWP output to add human value to forecasts. Assess relevant NWP output compared to observed total-column integrations. Interrogate mismatches with cross-sectional views and your 3D mental model. Identify a possible process responsible for the mismatch.